Deep under London there are 40 underground railway stations that are no longer in use for various reasons, presumably with lines that used to have some purpose historically but no longer go anywhere. They remain a historical curiosity and reminder that some routes in life go on to become significant whilst others that may have seemed equally valid at the time of their inception become redundant or reach dead ends. Similarly, musically there are numerous examples of artists who appeared to promise much and seemed to be heading for a significant destination, but for some strange reason their particular route to success ran into a dead end whilst other similar artists seemed to proceed onwards along more successful lines. Such an analogy seems particularly appropriate for Bakerloo who named themselves after the London Tube line as they felt they were an ‘Underground Band’. They released one album in November 1969, which has achieved cult status, and has recently been re-released by Esoteric Recordings, who clearly like to live up to their label name with the diversity and distinctly differing range of artists that they distribute. Looking back from the present day so far to 1969 could lead to hindsight cynicism or misunderstanding so it may be useful putting those times in context – Neil Armstrong had just landed on the Moon, England were still football’s World Cup Champions, Nixon had just become President of the USA, The Beatles released ‘Abbey Road’, British Troops deployed in Northern Ireland, Led Zeppelin released their first album, Concorde first flew, Woodstock and Altamont festivals were held, Charles De Gaulle stepped down as French President, Monty Python first appeared on BBC 2 with ITV commencing ‘On the Buses’ and ‘The Benny Hill Show’, US Forces were heavily embroiled in Vietnam, ‘Oliver!’ won the Best film Oscar in 1969 followed by the contrasting release in 1969 of the next Best film Oscar winner ‘Midnight Cowboy’ , Harold Wilson was UK Labour Prime Minister, homosexuality had recently been legalized in the UK and the last ever Number One UK single of the 60’s was bizarrely ‘Two Little Boys’ by Rolf Harris. Those historical events and cultural happenings may indicate that that this was quite an era of political turmoil, social change, contradictions and curious collisions between conventional mainstream culture and more experimental forms of expression. Rock music in the UK was dominated by The Beatles, The Rolling Stones, The Who, and the recently dissolved supergroup Cream still cast a long shadow over the musical world in which Bakerloo were born. Originally called Bakerloo Blues Line in 1967, Terry Poole and Dave ‘Clem’ Clempson originally struggled to find a drummer, going through various drummers who went on to play in more famous bands, such as Bill Ward (Black Sabbath), Pete York (Spencer Davis Group) and John Palmer (Family). Eventually they met Keith Baker and recorded their only album. It was based on their live set, which they had been honing in clubs and support slots. Most notably they supported legendary bands such as Led Zeppelin, King Crimson, Pink Floyd and Yes early in their careers. 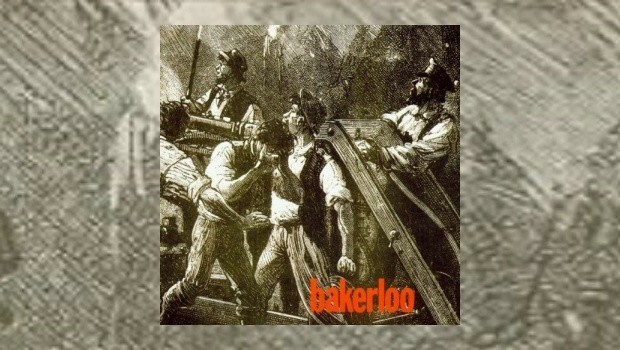 These were the days of an active and diverse live rock scene and the labels that have been divisively applied to much of rock music in recent years were non-existent or much less defined – Progressive rock was not a widely used term and Bakerloo’s ‘progressive blues rock’ simply fit the bill with these other ‘rock groups’. The album opens with a jazzy instrumental Big Bear Ffolly which showcases Clem Clempson on guitar in Ten Years After style. Willie Dixon blues classic Bring it on Home follows with Clempson playing a fine slide guitar in an altogether different style to Led Zeppelin, who adapted the same song in the same year. Displaying some impressive versatility Bakerloo then turn their hand to Bach with a harpsichord led piece called Drivin’ Bachwards, with Jerry Salisbury on trumpet. However, similarly to Bring it on Home another band, Jethro Tull, had also produced their own Bach based piece, Bouree. One has to wonder whether one reason Bakerloo did not break through is that their contemporaries were doing very similar things with more success. Last Blues features the bass and mournful voice of Terry Poole in a piece that moves from funereal elegy to powerhouse trio and back to a sad windswept coda. This Worried Feeling echoes Fleetwood Mac ’s Peter Green blues vocals and guitar style, but the alternate take bonus version with piano is more interesting. The most outstanding track is the finale Son of Moonshine, a song long enough in which to grow a substantial beard! This is a sprawling, inventive heavy progressive blues track, fully displaying the influence and inspiration of Cream. Baker and Poole really drive the song along powerfully whilst Clempson weaves and riffs his guitar lines sinuously throughout this epic track. This album, produced by Gus Dudgeon, was virtually their live set, usually recorded in no more than three takes. Son of Moonshine indicates they would have been a formidable and entertaining live outfit. The band broke up even before their album was released by Harvest. Clempson joined Colosseum and later Humble Pie. Poole later joined Vinegar Joe, whilst Baker was an early drummer with Supertramp and later joined Uriah Heep, all having talent to be successful elsewhere. Bakerloo shows that even short journeys can be interesting, even if they eventually hit a dead end. For Bakerloo probably too many others had gone down similar lines at that time, but one can wonder whether in different circumstances Bakerloo may have become more of a musical mainline? This is now really only a historical musical curio, albeit of an entertaining quality. Pull on a kaftan, light a joss stick, grow a beard while you listen and travel back to a different time and place when ‘rock’ was just ‘rock’!